2 What is a lime? A lime is a fleshy fruit of the citrus family. Native from Southeast Asia, with shape and size like a lemon, but a lime differs from it because the lime skin is thinner and greener. 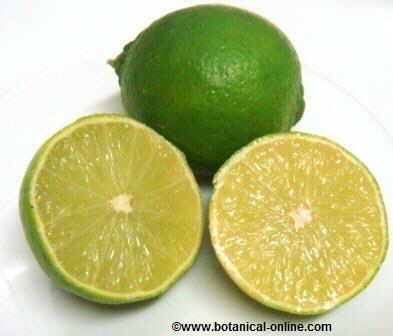 (Some varieties of lime have yellow skin). Lime flavor is sweet and sour, reminiscent of the lemon. It combines well with cilantro, lemon grass, turmeric and curry. Traditionally, as it has happened with lemon, lime was used to prevent scurvy, a disease that occurs when the person has a deficiency of vitamin C. Scurvy was common among sailors, which mainly fed on dry or salty foods. The lack of fresh foods (fruits and vegetables) in the diet caused numerous casualties among the sailors. Limes could endure fresh for long, so many captains offered them too the crew so that sailors would not fall sick. It is known that Christopher Columbus had limes in their cellars when he made his second trip to America, and it was he who introduced the fruit in Mexico, Florida and the Antilles. Lime is particularly suitable for people who have vitamin C requirements increased, as people who smoke, people with diabetes, allergy, asthma, pregnant or breastfeeding, or persons with stress. Due to its antioxidant properties, lime is a highly recommended food to help reduce cholesterol. It avoids good cholesterol oxidation, prolonging its positive effects. It also prevents thrombus formation and poor circulation. People with cardiovascular disease should take lime juice usually to help treat this disease. For its diuretic properties, lime is suitable for arthritis, gout and rheumatism. Eating lime will help us to have a healthier appearance, because vitamin C helps improve the health of skin, hair and nails. Eating limes, rich in vitamin C, is highly recommended for skin care from “inside”, that is to say, masks and skin creams can not penetrate into the inner layers of the dermis, where collagen is located. Taking foods rich in vitamin C, such as lime juice, promotes the formation of collagen from within, making the skin look younger with less wrinkles and sagging. Limes are rich in limonene, possessing antitussive anti-inflammatory and antibacterial properties. These properties make it very suitable to treat or prevent respiratory diseases, because vitamin C increases immunity and helps treat infections. More and more studies highlight the anticancer properties of essential oils. Lime contains limonene that has proved a protective role against breast, liver, lung, stomach and skin cancers. Limonene is in lime in parts richer in oils, mainly in the rind (because it contains essential oil glands, like in the rest of citrus), so we should also include this part when making lime juice.